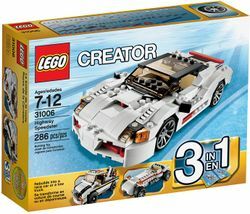 31006 Highway Speedster is a Creator set released in 2013. It can be built into a sports car, a racing car or a tow truck. This is a description taken from LEGO.com. Please do not modify it. Supercharge your speed and style in the 3-in-1 Highway Speedster! Facts about "31006 Highway Speedster"
This page was last edited on 15 March 2016, at 05:36.